The collaboration between TSK and Henriksen|Butler for the new Reno Showroom sought to reflect and preserve the unique cultural heritage of the original building. Built in 1936, the brick building has seen many changes over its history. Occupying the 2nd floor of this structure, the new H|B Reno Showroom is a showcase of the rich offerings from such manufacturers as Herman-Miller, 3-form and DIRTT. 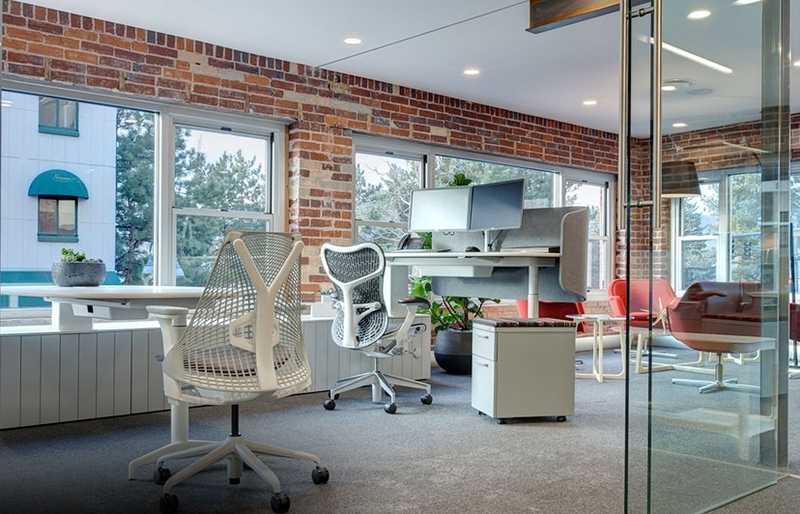 Designed to support the Herman-Miller “Living Office” model, the showroom’s integration to the surrounding environment creates a more natural and desirable workplace that fosters greater connection, creativity, productivity and ultimately, greater prosperity for all. Spaces are defined by specific “Settings” that provide individuals with optimal arrangements of their surroundings, tools and furnishings to best support the activities of both individual and group work arrangements. This new approach to workplace design will serve as a model for future office spaces in the region.